I already thought mangroves were pretty cool. I mean, these trees have evolved to live in some of the harshest conditions for plants on earth. For one, mangrove roots have to deal with extremely low oxygen all of the time. Why? Unlike non-wetland plants, mangrove roots are almost always submerged by water. Oxygen travels about 10,000 times faster in air than it does in water, which creates a barrier for oxygen transport from the atmosphere to the mangrove. The low oxygen environment also causes faster microbial turnover of nutrients, leaving little available for the mangroves. To make matters worse, mangroves grow in salt water, which decreases the osmotic gradient between roots and leaves, making water transport energetically difficult. Amazingly, mangroves have been able to overcome all of these stressors using a variety physiological adaptations and serve as important carbon sinks in the global carbon cycle. Mangrove forests are carbon rich systems. Carbon is taken up by the plants through the process of photosynthesis. The plant then stores this carbon in woody tissues and leaves while it is alive. As leaves drop, roots die, and individual trees perish, these tissues contribute their carbon to the saturated soils beneath the mangrove forest. This carbon becomes trapped in low oxygen environments below the water table, significantly limiting decomposition or decay rates (see this previous envirobites post to learn more about nutrients and microbes in coastal wetlands). When oxygen is low or non-existent in the soil, microbes are less efficient at breaking down organic matter. Thus, a large fraction of the carbon fixed by a mangrove becomes buried in the soil and trapped. Carbon trapping is a hot topic these days. As humans continue to fail at reducing carbon emissions, increasing and maintaining carbon storage in natural systems has become a desirable alternative. In order to accomplish this, we first need to know how much carbon these systems can actually store and the duration of that carbon storage. Multiple studies have estimated the amount of carbon stored in global mangrove systems. First, there is the carbon stored above ground in woody tissues and that stored below ground in live roots, dead roots and soil. Generally low resolution satellite imagery has been used to estimate mangrove distribution while in situ measurements of above ground and below ground live biomass and soil carbon has been used to calculate the amount of carbon stored across different mangrove ecosystems globally. Because of the difficulty in measuring below ground biomass (roots), allometric relationships (or biological scaling, read more here) are used to relate height and tree diameter with tree weight. The height of the mangrove canopy is an important parameter in the allometric relationship that has yet to be measured directly on a global scale. Previous estimates of canopy height were calculated using models based on many field studies that accounted for climate and latitude. However, a new study in Nature Geoscience by Simard and colleagues published in 2019 aims to better estimate above ground biomass and thus carbon storage of mangrove systems by directly measuring canopy height. The study used a combination of satellite data and on the ground measurements from 331 plots across the world to better estimate carbon storage of mangrove above ground biomass. The Shuttle Radar Topography Mission (STRM) provided the team with high resolution elevation data while the Geoscience Laser Altimeter System (GLAS) provided canopy height data from the year 2000. This high resolution technology gave the team a never before seen perspective of global mangrove ecosystems. The satellite data allowed the team to obtain values for average height and maximum height (the height of the tallest tree) located within an image pixel. With this data, the authors performed a global analysis of the physical controls of mangrove canopy height. They found that the world’s tallest mangroves, some exceeding 65 meters in height, live in areas of the world where there is abundant rainfall, low hurricane frequency, and warm weather all year round! Gabon, a country in West Africa, won the award for tallest mangrove trees (Figure 1). Figure 1: Image of mangrove forest in Gabon where the tallest mangrove trees on earth live. Source: Atticus Stovall. The study used this spatial analysis to estimate the amount of carbon stored in the above ground biomass of mangrove forests. There was significant spatial variability in the above ground biomass across the globe with height and density both playing important roles. The study’s total estimate of above ground biomass at 1.75 Pg (pectagram = 1,000,000,000,000 kg) is significantly lower than recent estimates but falls within the middle of a range of values that have previously been reported. Because height was directly measured at high resolution using satellite imagery in this study rather than gathered from small scale field studies and averaged across large areas, the authors believe their estimates to be more accurate than previous studies. As with all science, there remains plenty of room for improvement. Where does mangrove forest carbon estimation go next? Estimating forest carbon storage is an ongoing endeavor. In this study, in situ field data was used to both validate directly measured satellite data and obtain information to guide allometric models for calculation of carbon storage. Accurate allometric models are extremely important in calculating carbon storage and have until recently been time consuming and cost prohibitive to obtain. For instance, this study used direct measurements of individual tree heights and diameters obtained by measuring one tree at a time within study plots across the globe which required a lot of time and money. Atticus Stovall, a NASA postdoctoral fellow who was not directly involved in the study, described how the technology he uses is changing the game of forest carbon storage estimation. He explained that terrestrial lidar images measure the diameter and height of multiple trees at the same time, giving scientists an unprecedented ability to calculate tree biomass and thus carbon at high resolution within mangrove forests. 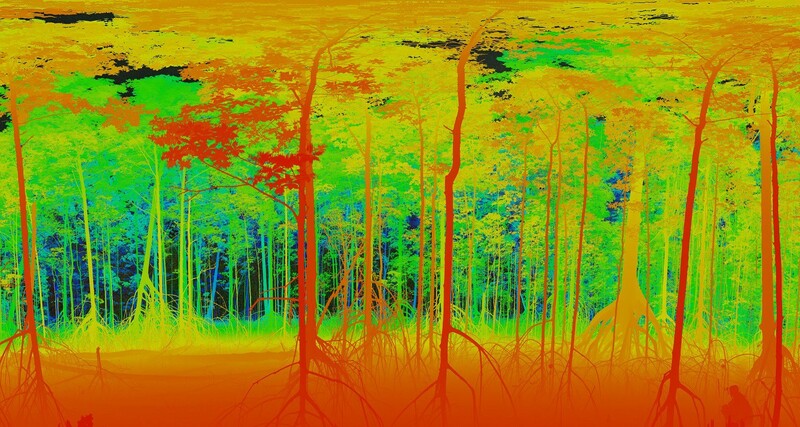 This technology combined with new satellite lidar missions such as NASA’s Global Ecosystems Dynamic Investigation (GEDI) sensor will provide the most accurate estimates of forest carbon ever obtained. Scientists will no longer have to rely on sparse data from individually measured trees. Hopefully, advancements such as these and the work performed by devoted scientists will allow us to more effectively use natural ecosystems to offset or temporarily delay ever increasing carbon emissions. ← Are your car’s windshield wipers helping your town’s stormwater management?